The weather in February has been a little harsh, so taking advantage of some improved weather forecasts and in order to get some silver fish practise in before my week at Stafford Moor with the Match Fishing Scene crew I decided to head to Kingsland Reservoir, Coates, Peterborough and have a session on the Silverfish lake. As usual, my mate Mark joined me, so this was going to be a battle for a point in the 2012 Mark vs Mark competition. ﻿Kingsland Reservoir allows the use of keepnets during pleasure fishing sessions, so I purchased a proper match weigh sling for us to record more accurate weights for the 6 hour session. The weather for the day was overcast and the mecury was hitting a massive 8 degrees C with quite a blustery wind. We both decided to fish with the wind at our backs and selected two pegs dividing the middle of the silver fish lake. The aerator split our pegs and was an area that we would both target as potential fish holding areas with differing amounts of success. 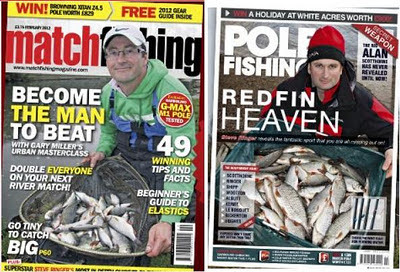 In the latest edition of Pole Fishing Magazine and Match Fishing Magazine both Jon Arthur and Alex Bones have asked for guest blogger submittals, so I sent Jon Arthur a quick email. Jon Arthur gave me some great feedback, so future blogs will contain more anecdotal information such as strange, interesting and unusual things that happened on the day with some more interjections of humour to turn each blog entry from a diary of what happened on the the day into a story about the day.